After almost a year of rumors and speculation, Elon Musk did everything but confirmed today that the Tesla Model 3 will not feature a head-up display. Interestingly, Musk didn’t offer any alternative for the instrument cluster and instead, he said that drivers don’t need the information as much due to autonomous driving. Of course, it’s true, you don’t need those metrics at all if the car is doing all the work, but if that’s the reason why there will be no HUD or instrument cluster, it sort of assumes that fully self-driving will be always available everywhere. And that’s a wrong assumption to have, especially since the vehicle is scheduled to come out in 4 months and even if the tech magically becomes ready in time, autonomous driving levels 3-4-5 require regulatory approval, which is out of Tesla’s control. Based on his response, it sounds like the 15-inch center screen will serve both as an instrument cluster and as the center stack. We discussed it before, but it’s clearly a compromise since like Musk said, the design is taking into account self-driving capability. When manually driving the Model 3, it’s suboptimal at best. It goes to show that Tesla is betting on self-driving with the Model 3. Unfortunately, we still don’t have a clear timeline for the release of level 3-4-5 autonomous driving capabilities by Tesla. Musk said that the ‘Tesla Vision’ image processing system and new hardware suite will enable level 5 autonomous driving, which he plans to demo by the end of the year with a trip from Los Angeles to New York, but that doesn’t mean that it will be available in Tesla’s vehicles. They will need to supply regulators with millions or even billions of miles worth of data in order to obtain approval. 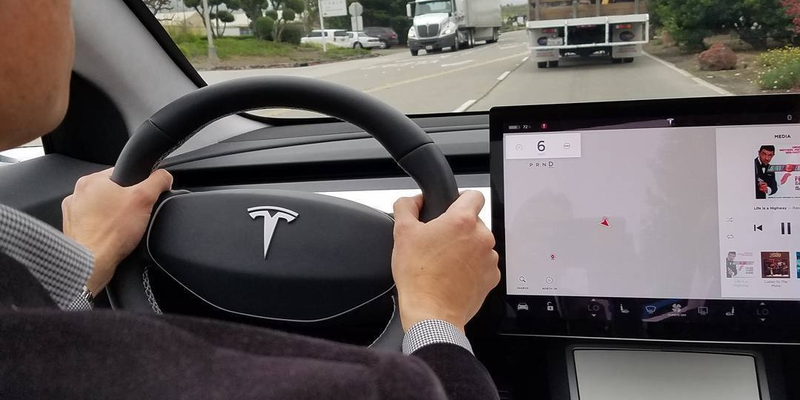 In the meantime, it sounds like Model 3 drivers will be limited to the center screen for the speedometer and other info that drivers generally have on their instrument cluster. What do you think? Can you drive with only the center screen? Let us know in the comment section below.